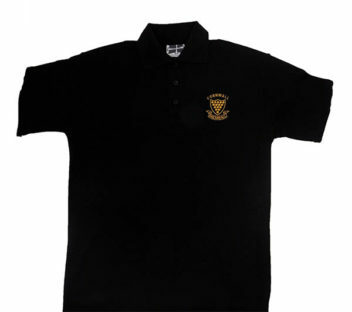 Our Cornish Shield Polo Shirt epitomises relaxed Cornish Style! Cornish black polyester/cotton mix with distinctive gold embroidered Cornish Shield to left chest area, self colour button, placket and cuffed sleeves. A classic fit that suits One And All!